Welcome to the 34th issue to subscribers of Right Writing News. If you are reading this issue forwarded from someone, be sure and use the link below to get your own free subscription. 4) Why Is This October Book Ranked So High? In these days of unreturned phone calls and unanswered emails (yes it happens to me too), at times, it's easy to wonder if you are making a difference. If so, where are you making that difference in the lives of others? From my experience, it will take a conscious effort on your part. Are you learning something new? It seems like every time I turn around I'm gaining some new bit of information. What are you doing to be a good steward of that information and pass it on to others? For example, in my agency, someone contacted me with a 190K novel--which is over the top too long. Go to this entry and follow the links if you want to know more about the expected length of novel. Why is this important? Because if you have a mass of material coming your direction as an editor or agent (and we all do), then one of the quickest ways to sort things into the rejection pile is based on word count. A huge manuscript is going to take a tremendous amount of editorial work to get it to the right length if it is too long. Several months ago, I rejected a novel on the basis of word length. Today this novelist came back and said she had managed to trim her 190K novel into 120K would I now take a look? I was flattered that she had taken the time and energy to cut her story and maintain plot lines and other things (according to her note). Yet it was still too long in my view to capture my interest. From my experience anything over 110,000 words is going to struggle to find it's place of publication in the marketplace. So it's not a good use of my time as an agent--and I told her so.Thank you but still no thank you. Then I got another submission addressed to my personal mailbox, and misspelling Literary in the name of my agency. Yet on the inside the submission began, "To Whom It May Concern" and also did not include a title for their proposed novel. I could have just returned my standard rejection letter but I made a point to call it to her attention so she could change it in the future. I recently wrote about Mark Levine's book on the Fine Art of Self-Publishing. I have personal connections to two of the Print On Demand publishers in the "Publishers To Avoid" section of the book. I could have ignored it but I didn't. Instead I brought the information to leaders in each of these two publishers. One publisher had moved from the recommended category to the avoid category and when I told her about it she said, "Why whatever it is, we will fix it." The other publisher made the opposite choice with the information saying, "We weren't fairly treated and this book doesn't know what they are talking about." Many years ago I learned that when you bring information to someone they have two choices. They can either resist and contend that you do not have the full picture, then make some excuse. Or they can make an effort to grow and learn from the situation. I try to take that latter road and grow as much as possible. I continue to grow and improve. 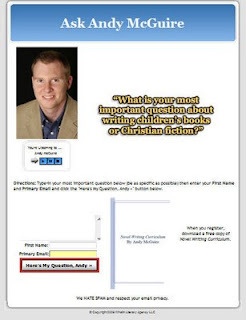 Recently I held a free teleseminar about book proposals at Askterrywhalin.com. After the teleseminar, I changed the material into the replay mode--but the date remained on the front page (which is not supposed to happen). It could have thrown me off and stopped me from holding additional teleseminars. It hasn't. 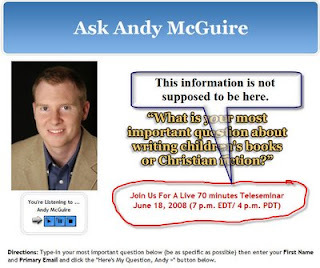 The date was also on the teleseminar I did with Andy McGuire (see the illustration). As you can see from this second illustration, my date problem has been resolved. Apparently I was missing a line of computer code some place and now my various teleseminars which are in replay are working. My encouragement is for you to pass along the lessons that you are learning to others. You can make a difference in the lives of the people around you. The last time I wrote about platform, I received several vocal comments--especially from the fiction authors, who many times believe they don't need a platform. Yes, story is important but increasingly the better your platform, the more likely to sell your book. Every writer has great dreams and aspirations of selling many copies of their published book. Stephanie Chandler gives you the real story about publishers. They can make beautiful well-crafted books but selling those books? That's a key responsibility for the author. THE AUTHOR'S GUIDE TO BUILDING AN ONLINE PLATFORM gives writers the critical tools to sell their books into the marketplace. As Chandler writes at the bottom of the first page of Chapter 1: "The reality in the world of publishing is that without marketing, a book simply cannot be successful. And even if you have the biggest publishers on the planet behind you, it is unlikely that they will run your entire marketing campaign for you. You will still be required to do the majority of the work." In a no nonsense style, Chandler gives you the details to stand apart from the run of the mill book submission or published book author—because you will be motivated and informed to sell more books." Content really is king. Not only does it give your site visitors a reason to return to your site, but it gives the search engines plenty of reasons to index your pages. Load your website with articles, links and other resources. By offering free information, you can convert many of your visitors into paying customers. Online newsletters or e-zines are powerful tools for keeping your name in front of your customers. Pay attention to the e-zines you receive from other businesses. What do you like about them? What could you do better? Publish yours weekly or monthly and make sure it offers plenty of value. This is your chance to build a rapport with your readers while you soft-sell your products and services. Information products are powerful revenue generators. Product opportunities include books, e-books, special reports, teleseminars, workbooks, tips booklets, mp3 files and virtually and form in which you deliver information. Use your expertise to develop products that your site visitors need. Electronic products are ideal passive-income earners since once the product is created; it can continue to sell for years with little effort on your part. Once you create a quality product, you need to convince customers to get out their credit cards. Offer a list of product features, testimonials from others who have enjoyed the product, and appeal to your buyer's emotions. The key to successful ad copy is to identify the buyer's need and show them how your product will fill that need. The key to passive income is to minimize the amount of work involved. Instead of manually responding to every sale that you make or every inquiry you receive through your website, you can automate these tasks. Add a shopping cart solution to your site such as www.1shoppingcart.com, a comprehensive shopping cart solution or www.payloadz.com, a service that automates electronic file delivery. You can sell other people's products and services directly through your website and earn a percentage from every sale. Find products and services that compliment the content on your site. Popular affiliate programs include those offered by Amazon.com, Google Adsense (www.google.com), and Commission Junction (www.cj.com). Your shopping cart service provider may also allow you to implement your own affiliate program so that you can empower others to sell your products and services. You can also create affiliate programs through services such as Click Bank (www.clickbank.com) or Pay Dot Com (https://paydotcom.com/). Drive traffic to your site by spreading your website link across the Internet. Some strategies to employ include swapping links with other businesses, publishing articles online through services like www.ideamarketers.com and www.ezinearticles.com, submitting press releases through www.prweb.com, and purchasing classified ads in industry publications. Try to do one to three tasks every day to market your business and soon your website traffic will begin to explode. Continue the Product Development Cycle. Be on the lookout for new product opportunities. Pay attention to what questions your customers are asking so you can create products that they need. Each new product should help increase your bottom line by generating new income streams and new reasons to advertise your business. Keep in mind that customers who liked your previous products will be more likely to purchase new products from you for years to come. Stephanie Chandler is the author of several business and marketing books including FROM ENTREPRENEUR TO INFOPRENEUR: MAKE MONEY WITH BOOKS, E-BOOKS AND INFORMATION PRODUCTS. She is the founder of www.businessinfoguide.com, a directory of resources for entrepreneurs and www.thebusinessgrowthconnection.com, a marketing company specializing in electronic newsletters. You may recognize that I've been writing about a number of these elements through these entries on The Writing Life. 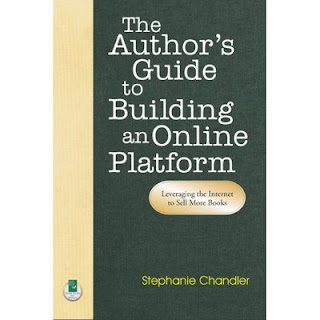 Stephanie Chandler pulls this information into a worthy resource that I recommend: The Author's Guide to Building an Online Platform. Are you leveraging the power of your book to engage your reader? You may be wondering what I'm talking about since many people see the book as their end goal. These people are trying to learn the craft of writing and take the necessary steps to get their ideas into print--which is a great starting place in the journey. The book isn't the end but it's the beginning in many regards. Repeatedly I've heard my friend Alex Mandossian say, "People do not make money writing books (true). People make money explaining books." I've probably burst a few people's dream with those words about making money writing books. In the last few days, I've read Patricia L. Fry's excellent book, The Right Way To Write, Publish and Sell Your Book (more about this soon). Fry writes on page 14, "The Author's Guild has determined that a fiction book is successful if it sells 5,000 copies and a successful nonfiction book sells 7,500 copies." Arielle Eckstut and David Sterry write in Putting Your Passion Into Print that less than 10% of books published (yes fiction and nonfiction) ever earn back their advance. These statistics are the norm and you could break out of the norm but realize what you have to overcome and leverage to make that happen. While hope springs eternal, it is good to root your hope in reality. Mikos pointed me to read this article from the EDITOR-IN-CHIEF Noelle Skodzinski. Here's the paragraph from this article that I want to point out: "Books have a power, for many of us, unparalleled by television or movies. We grow strangely attached to the characters. I recently finished reading “Water for Elephants” and didn’t want the story to end. I wanted friends to read it, to share the experience. And I definitely want to read another book by Sara Gruen. Fortunately, the publisher was smart enough to tell me what other books she has written."